RCB XI: Parthiv, Y Takawale, Virat, Yuvi, AB, Albie, Muralitharan, Dinda, Starc, Chahal & Varun Aaron. No Gayle for RCB, but this man is playing today. Kallis defends and it almost runs onto his stumps - he is however, off the mark after a quick single. OUT! Gambhir lbw b Starc 0 (1b, 0x4, 0x6) Gambhir is gone on the first ball he faces! LBW and Starc gets the wicket. That was yorker length and would have hit the leg stump - a little bit of swing too. OUT! Pandey's gone now! He got a four in the same area on the previous ball but he can't beat Kohli at short cover this time. Four! Kallis with a lofted straight drive and that's gone for runs -- welcome runs. That's quite a bad start for KKR -- they've lost two vital wickets and the RCB bowlers have their tails up. There's great bounce on the pitch and it looks like it's been hard to control the shots. Will get better with time. Kallis tries to flick one away off his pads but that are is well covered. He needs to stick around and tailor a partnership now. Oh what a lovely shot from Kallis! Pure class as he uses pace to cut away for four. KKR 22-2 after 3 overs. Varun Aaron into the attack now. Whack! Four more for KKR, this time Lynn makes some room and hits one past the bowler. Ooooo! Much better from Aaron as he beats Lynn in the next delivery. Kallis and Lynn seem to be gaining confidence with every over now. Yes that's the way, and the KKR dugout is suddenly alive. Lynn's drive through the offside spins past the fielder for four. And another one! Back-to-back fours for Lynn on the offside. This guy hits it hard. KKR have fought back well. Oh that must've hurt! Awkward bounce & Kohli gets smacked on the face while fielding. Bit of blood and bandage there. 6 overs gone and KKR are 42-2. Good comeback after losing Gambhir and Pandey early in the innings. 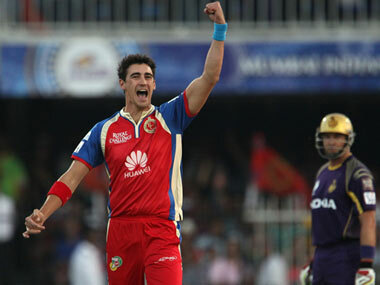 Starc got the first breakthrough for RCB. SIX! Murali's first delivery smashed for six by Lynn & it almost hits his picture on electronic scoreboard. And another six! Lynn has taken a liking to Murali, gets down on his knees and sends one over square-leg. What a shot. 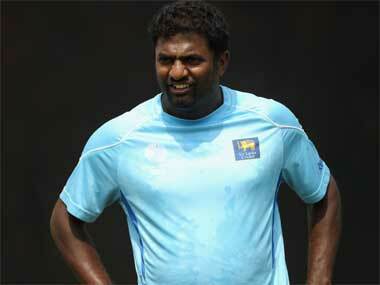 With 1347 international wickets Muttiah Muralitharan comes into the attack & first ball he is hit for six. Welcome to the #IPL . Now Chahal into the attack -- he's had a couple of fine games for RCB. They've got to break this stand. Dropped! Starc right at the ropes -- probably got nervous and he's dropped Lynn. What's more, it's six. And now Kallis goes after Murali! Same area, same slog-sweep and it's gone for six. Quite hard to believe - KKR were 10-2 after 1.2 overs and are now 82-2 after 10. Great fightback. Happy birthday to my good friend Sachin !! Hope you're having a great day buddy.. ????????✨???????? Aaron back into the attack and he's beaten Lynn twice in a row. If there is one bowler who could break this stand, it is him. Very good line and length. And OUT! Lynn c de Villiers b Aaron 45 (31b, 3x4, 3x6): Lynn (45 off 31) frustrated by Aaron and he's hit one straight to De Villiers. KKR 90-3 in 11.3. OUT! Yusuf Pathan is gone for a duck. KKR 90-4 in 11.5. That's such a loose shot. STAT: Gambhir has ZERO runs in #IPL so far. Pathan has 15 (both hv faced total 27b). Young Suryakumar Yadav has more than both in just 8 balls. Oh Chahal with a lovely over - gives away just four runs in it as KKR stutter after that Lynn wicket. They've brought the 100 up though. It has slowed down so much that it's not even funny. Since Lynn's wicket, KKR have scored 17 runs. Chahal finishes his four overs with 1/26. He's having an excellent tournament so far. Four overs to go and Kohli brings on Starc now. Robin Uthappa is out there so we should expect some fireworks -- that boy Suryakumar Yadav is not a bad hitter of the ball too. Oh what a shot! Yadav walks inward and lifts a six off his pads with ease. Wow! And what is that! Yadav picks one from way outside off-stump and uses his wrists to get FOUR through mid-wicket. What a man.